A detail of a NCAA logo decal is seen at center court in 2010. 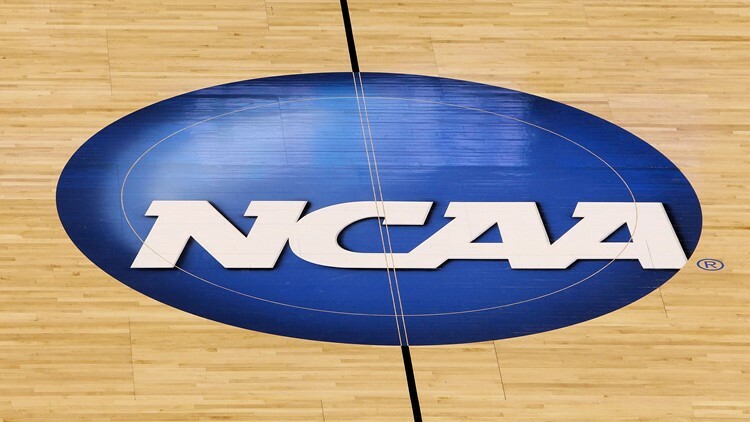 Prosecutors said the case exposed the underbelly of college basketball recruiting. NEW YORK (AP) — An Adidas executive and two other insiders from the high-stakes world of college basketball recruiting were convicted Wednesday in a corruption case that prosecutors said exposed the underbelly of the sport. The trial centered on whether the men's admitted efforts to channel secret payments to the families of top recruits luring them to major basketball programs sponsored by Adidas was criminal. At stake was a fortune in revenue for the basketball programs and potential endorsement deals for the players if they went pro. Prosecutors claimed the schools were in the dark about the payment schemes, including $100,000 promised to Bowen's family, that are outlawed by the NCAA. They accused the defendants of defrauding universities by tricking them into passing out scholarships to players who should have been ineligible. The behavior "tells you an awful lot about the defendants," the prosecutor said. "It tells you that what they were doing was wrong." The defendants didn't deny they sought to make the payments. But they argued that was how the recruitment game was played by Adidas, Nike and other sportswear companies - and that talent-hungry coaching staffs knew it. "What proof did the government present that Louisville suffered any harm?" attorney Steven Haney said in closing arguments. "In Christopher Dawkins' mind, he thought what he was doing was OK."
Defense attorneys sought to convince the jury the text messages and phone records showing Self and Patinto were in touch with the recruitment middlemen aligned with Adidas proved they had to be aware of the payments. They said further proof the schools weren't blind to the schemes was testimony by Brian Bowen Sr. claiming he received $1,300 from Louisville assistant Kenny Johnson and other testimony by a cooperator, former Adidas consultant, Thomas "T.J." Gassnola, that he delivered $40,000 to North Carolina State assistant coach Orlando Early intended for the family of highly-touted point guard Dennis Smith Jr.
Self responded: "We good," according to an exhibit of the communication. Gassnola said: "Always. That was light work." Another exhibit showed how Dawkins texted Pitino as Bowen was nearing a decision about where he would play, asking, "Would you have any interest in Brian Bowen or are you done with recruiting?" Pitino responded: "We would love to have him." The trial's most emotional moment came when a prosecutor first began questioning the elder Bowen about his son, who goes by the nickname "Tugs." "Is Tugs in college?" asked prosecutor Edward Diskant. "No, he's not," Bowen responded.